Japanese gadget companies DO have a strange attitude when it comes to answer the question of how to relieve stress for Nippon’s exhausted salary men and house keepers. In the past, CrunchGear covered a stress-absorbing vase, a healing headset and a pocket calculator that can help you blow off some steam. 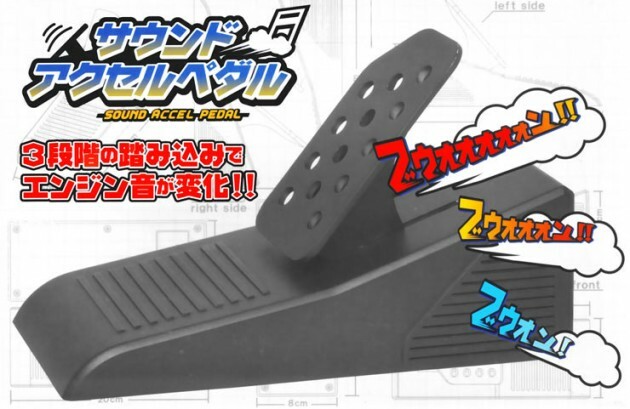 And now comes the Sound Accel Pedal [JP]. I don’t know what kind of mind can come up with such a device but here is how it works: The only thing the user can do is to step on the pedal and listen to a motor sound coming out the device. That’s it. Sounds are made in 3 levels (loud, louder, loudest), depending on how hard you step on the pedal, which is battery-powered. The Japan-only gadget costs $30. If you don’t live in Nippon and if you are seriously interested in buying the pedal, you can make an inquiry at shops like this, this or this one. The latter even lists the shouting vase, which is very cool. And before you (rightfully) ask: No, the padel is not made by Thanko (it has no USB port, after all).